Luxury accommodation in an idyllic paradise setting. 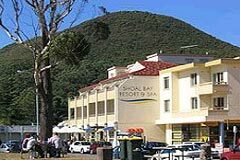 Shoal Bay Resort & Spa in Port Stephens is the perfect retreat for all types of travellers or holidaymakers, successfully blending charm and warmth with sophistication and hospitality. Set on the pristine sands of Shoal Bay at Port Stephens, Shoal Bay Resort and Spa is just over two hours drive from Sydney. The resort offers complete range of suites, apartments and villas that are all comfortable and well equipped with several modern amenities. From relaxed, casual dining to impressive a la Carte service, Shoal Bay offers a number of dining options to complete your holiday experience. Whitesands Convention Centre provides a choice of three separate meeting rooms, purpose built boardroom and well designed lobby area. In addition, the Aqua Spa encompasses a heated lap pool, three spa pools, six massage rooms, three aqua therapy rooms and a cardio fitness centre. Discover affordable and convenient accommodation in an idyllic setting. Frolic in the crystal-clear seas. Relax and pamper yourself in the stunning new Aqua Spa including hot & cold spa pools, a 25-metre lap pool and the exclusive, new Yon-Ka™ Treatment Centre. And enjoy comfortable, modern surroundings with many restaurants, pubs and swimming pools. Take in a variety of water-based activities. Adjacent to Tomaree National Park, you’ll find bush-walking and sweeping views of Nelson Bay. The popular Sand Dunes at Stockton have a wide range of available tours and activities. 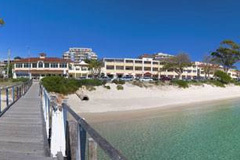 And the Port Stephens area is a mecca for golf and fishing enthusiasts from around the world. Set on the pristine sands of Shoal Bay at Port Stephens near world-renowned Nelson Bay, Shoal Bay Resort & Spa is the exciting rebirth of the Shoal Bay Country Club Hotel.